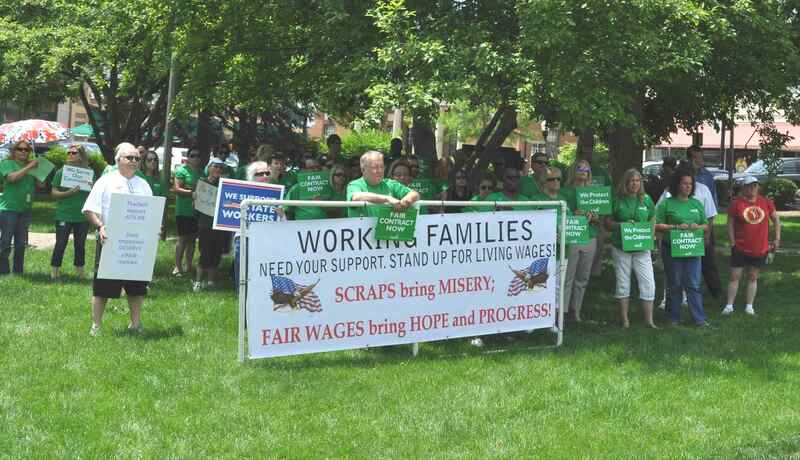 About 50 members of the American Federation of State, County and Municipal Employees (AFSCME) held a rally of sorts in the Woodstock Square today, in conjunction with similar events being held statewide. The event contained the usual litany of union hyperbole, the same drek we’ve been listening to forever: how unions are the voice for the little guy, how it’s us against the rich and powerful, and that without unions, the American middle class would shrink to nothing. One wag standing off to the side observed that Barack Obama is doing a good job of making that happen all by himself, thank you very much. Of course they mentioned all the houses owned by Bruce Rauner, but they neglected to mention the fact that those houses were bought with his own money that he earned himself. There were moments of humor. After the rally leader got cheers for mentioning the job gains of the Clinton administration and how we all suffered penury at the hands of the Bushes, when he touted the accomplishments of Barack Obama, you could have heard a pin drop. The best line of the day was from R.B. Thompson, bless him, when he said that it was because of unions that his dad lived to be 91. We may not all live to be 91, but if we have to continue to endure the steady decline into a state of total decrepitude that’s being created by the public sector unions in Illinois, it’ll certainly seem like it. This entry was posted in Public Sector Unions and tagged AFSCME, Unions. Bookmark the permalink.